Here I am telling it like it is (far right). 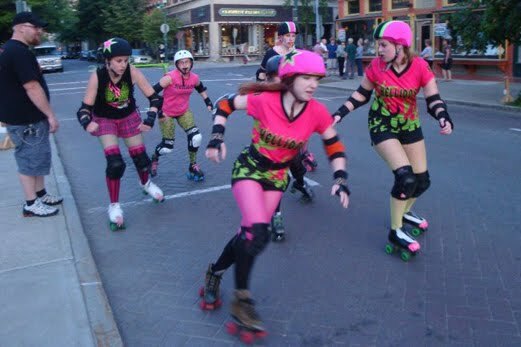 There was great weather for skating Friday night at Troy Night Out. We were skating right next to Monument Square - the City put up barriers so we had a whole block (2nd & Broadway) to skate around and give demos. I was nominated to give a lowdown on the rules and explain how the demo would go down. We gave demonstrations every 20 or 30 minutes. 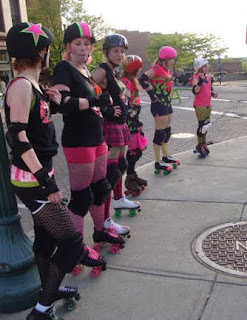 "Bouting" on that cobblestone was NOT easy. 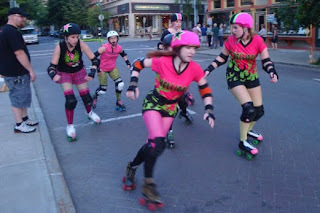 I don't love this picture, because it shows the other jammer busting through my defense, but here's the group of us tearing up the cobblestone. We had a great time! Thanks to everyone who stopped by and said hello, including Kevin Marshall and the girls from Some Girls Boutique.